I don't know why that even a 45 minute flight basically takes the whole day. With the exception of a walk around Berlin in the morning with Ganesh, basically the entirety of yesterday was packing our stuff, going to the airport, going through security, waiting for the check-in to start, finding the gate, sitting there waiting for boarding, sitting inside the plane, taxi-ing around, the actual flight, taxi around again, get our luggage, find a taxi, go to the hotel, the end. I just don't understand how it takes all day. But that was yesterday. Today I am here in Düsseldorf, Germany, which is much quieter and more remote than Berlin was. It is next to the Old River Rhine. I just found out that the Tour de France is starting here, of all places. In Düsseldorf. Three days after we leave. I know. It's so close that it almost hurts. Not only the first stage of the Tour de France, but the first two stages of the Tour de France are going to be in Düsseldorf. That just isn't fair. Nope. This place has a lot less people walking around and is a little bit more scary. Creepy people kind of meandering around, I definitely have to be a little more vigilant here. 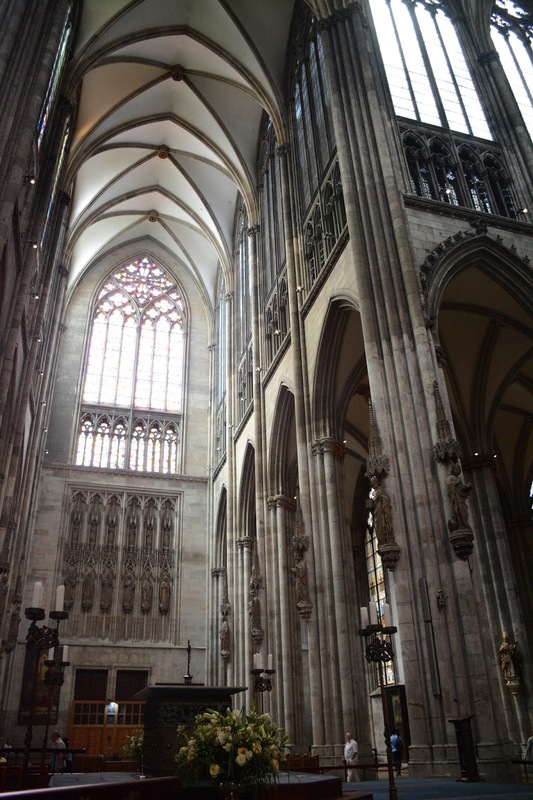 At lunch time I walked to the Cathedral called the Cologne Dom built in the 1200s that happens to be down the street. It's spectacular. I spent about an hour slowly making my way through the inside trying to be a photographer. Talk about a hard place to shoot. It's dim inside the place and the stained-glass windows are really bright, you just can't get both at the same time. Lot's of people and everything is really tall and big and won't fit into the frame. Unless you turn the ISO up to like 3000 the shutter is just too slow to handhold. Definitely a super challenging location to get good shots. I thought oh it might be cool to have a slow shutter speed then the people will be all blurry walking around, and it might hide the fact that all the people are silly tourists with their safari hats, fanny packs, or shopping bags that say "I ♥ Köln." But of course I have to basically hand hold it against a pillar which is not super steady, and it almost worked. There were these monk/priest dudes that were watching me very carefully since I was doing weird things and leaning against pillars. So I put some coins in a donation box and they seemed to chill a little bit. I did what I could, and I then I just started getting really tired after about an hour of that. Immediately outside the cathedral is a camera store. I found it interesting that in the window was both wide aperture and wide angle lenses. They knew that's what you will need inside the building. They are just hoping that some photographer will be like, "Noo! If only I had a wide angle lens!" and then they say, here you go, sir. In the evening Ganesh and I went to beautiful Café Reichard in the courtyard in front of the cathedral. It was quite amazing. The food was so tasty and the coffee came in a real silver pot with bright red carnations in raised beds lining the walkways. It's a 150-year-old place apparently. Ganesh had a veal Schnitzel which I tried a bite. I am normally morally opposed to veal, but it's pretty hard to oppose when it tastes so darn delicious. Then we walked along the rhine during the magic hour of sunset and it was really beautiful. Then we went to the bridge called Hohenzollernbrücke where all the people place a lock to represent their love and throw the key in the river. There are millions of locks. I wonder how heavy they all are. I wonder when the bridge will collapse with the weight of all the promises of love and affection forever. 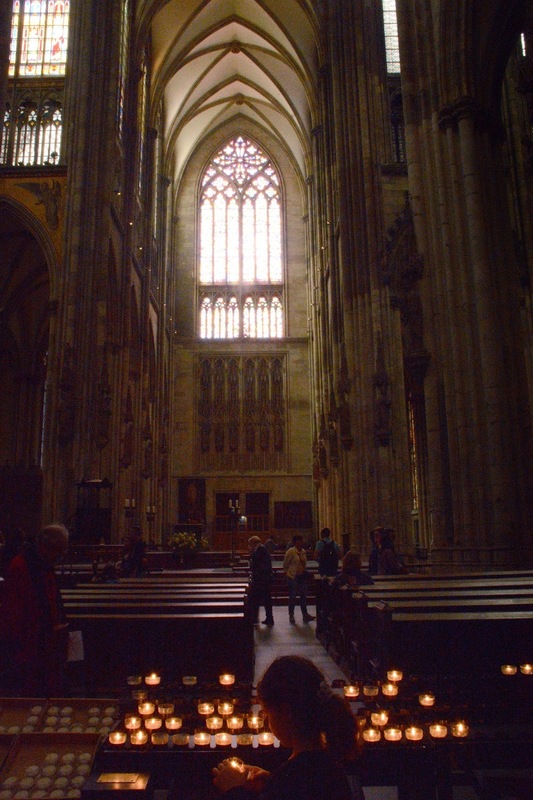 Ganesh snapped this shot of me as the sun was coming through the stained glass windows. There's a bridge with millions of locks on it. People in love out a lock on the bridge and then throw the key in the Rhine below.